What Day Of The Week Is June 2? 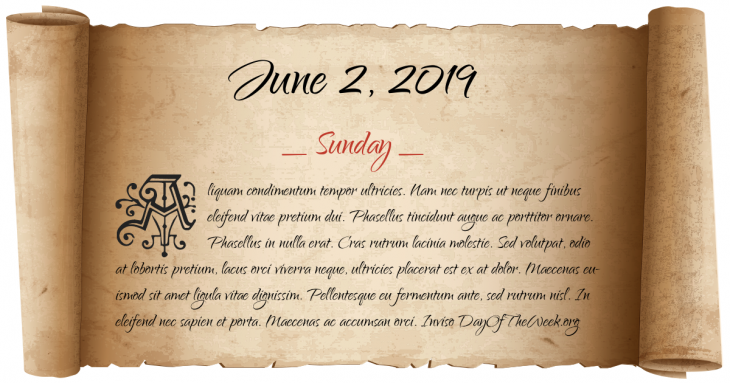 June 2, 2019 is the 153rd day of the year 2019 in the Gregorian calendar. There are 212 days remaining until the end of the year. The day of the week is Sunday. Bridget Bishop is the first person to go to trial in the Salem witch trials in Salem, Massachusetts. Found guilty, she is hanged on June 10. Anarchists simultaneously set off bombs in eight separate U.S. cities. U.S. President Calvin Coolidge signs the Indian Citizenship Act into law, granting citizenship to all Native Americans born within the territorial limits of the United States. During the 1962 FIFA World Cup, police had to intervene multiple times in fights between Chilean and Italian players in one of the most violent games in football history. Surveyor program: Surveyor 1 lands in Oceanus Procellarum on the Moon, becoming the first U.S. spacecraft to soft land on another world. Pope John Paul II first official visit to his native Poland, becoming the first Pope to visit a Communist country. After an emergency landing because of an in-flight fire, twenty-three passengers aboard Air Canada Flight 797 are killed when a flashover occurs as the plane’s doors open. Because of this incident, numerous new safety regulations are put in place. Who were born on June 2?